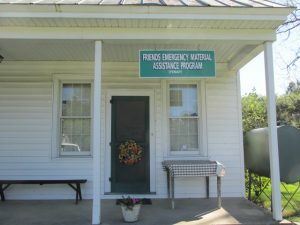 FEMAP is a ministry of many Quaker meetings in North Carolina who work together to provide practical help for victims of natural disasters, as well as infants and children and farm workers. The FEMAP office and work rooms are located in the historic Allen Jay house on the grounds of Springfield Friends Meeting. During the years after the Civil War, Allen Jay and other generous Friends worked out of this same house to distribute school books and other material assistance to the devastated communities of the South. So, in a way, FEMAP is providing a similar ministry today! 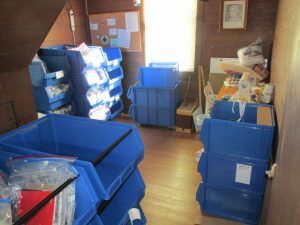 Farmworker kits for migrant workers here in North Carolina and elsewhere in the U.S.
You can help by donating items for kits, money for shipping, volunteering on Wednesday mornings, or by knitting or sewing at home. Handmade items such as afghans, infant and children’s clothing, sweaters and hats are also distributed. 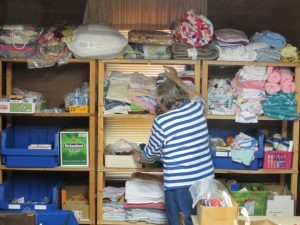 Many friends of FEMAP also contribute good-quality hand-crafted or quilted items which are sold to raise money for shipping costs.